At Hippo Hug we strive to create human solutions for human struggles. Hippo Hug weighted blankets was founded in Calgary, Alberta, Canada, by Leslie Brooks in October 2011. Leslie saw an opportunity to combine her love of sewing with her passion for helping people. In late 2011 Leslie created a custom-made weighted sleep sack for a client with Autism who was seeking deep pressure at night. She saw the opportunity for a small business venture, and with the encouragement of her husband began the journey of entrepreneurship. Hippo Hug was born and as the business grew so did our knowledge about the numerous people that weighted blanket can help; we get to hug people across Canada without ever leaving Calgary! Hippo Hug has gone from a small home-based business that made 60 blankets in its first year to a full-fledged manufacturing operation, shipping blankets across Canada and the U.S. In 2016, Hippo Hug saw huge growth, completing over 500 blankets and moving into a manufacturing space. Our growth has been steady since moving to 246 62 Ave SE Calgary, Alberta; in 2017 we made 1250 weighted products and in 2018 nearly 1800. 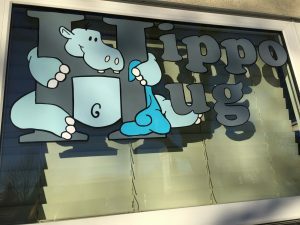 Hippo Hug now has nine part-time employees and Leslie full-time at the helm. Everyone at Hippo Hug loves helping people find a Made in Canada solution. Many of the staff use a weighted blanket themselves and have first hand knowledge to share to help you find the right fit for your unique needs. We are committed to making sure a weighted blanket will work for you and finding the size and weight that will fit you best. We pride ourselves on compassion, customer service and weighted blanket expertise. In a busy world, we create Canadian-made weighted products to settle the body, comfort the soul and provide calm because we believe that everyone should come home to a hug.